Black 2 and White 2 Pokémon: N's Pokémon | They're totally not yours.. Upon first entering Driftveil City, you'll stumble across the old Team Plasma who will require your help. After you have helped them out, you'll be given a very special Pokémon, the normally rare Zorua, as a gift. But it won't be any random Zorua that the Sage will give you, this Zorua will be N's old Pokémon, displaying his trainer name, his original ID and will always have a Hasty nature. He will inform you that, should you use the Memory Link with your copy of either Pokémon Black or White, that there could possibly be many more of N's old Pokémon in the wild. Using the Memory Link, you'll be treated to a flashback of when N started to release his Pokémon at the end of the Chargestone Cave. 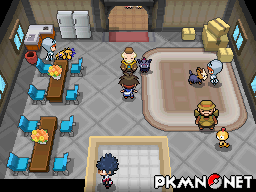 Once the flashback has ended, you'll find that the event has been activated and that all of N's Pokémon that he had on his team up until the end of Pokémon Black and White, not including the legendary Pokémon, can be found in the wild at specific locations. As you encounter his Pokémon, as you would with any wild Pokémon there, you'll find that the Pokémon will flash not too dissimilar to how a shiny Pokémon would, with a note being displayed on the screen to make you aware that you're facing one of N's former Pokémon. They will always have the same nature, as displayed below, as well as being the same level and possessing the same moves and ability. They'll also have the same OT, ID and will display a message on their status screen that they "used to be owned by a powerful trainer". In addition to this, as they are formly owned by N, you will not be able to nickname them. Shaduin on Fri 12 Oct 2012 20:07:07 UTC. Muklas on Thu 08 Nov 2012 17:20:33 UTC. You can, seeing as I grinded on N's Darmanitan before hitting the gym. Page generated with 102 queries, excitingly.